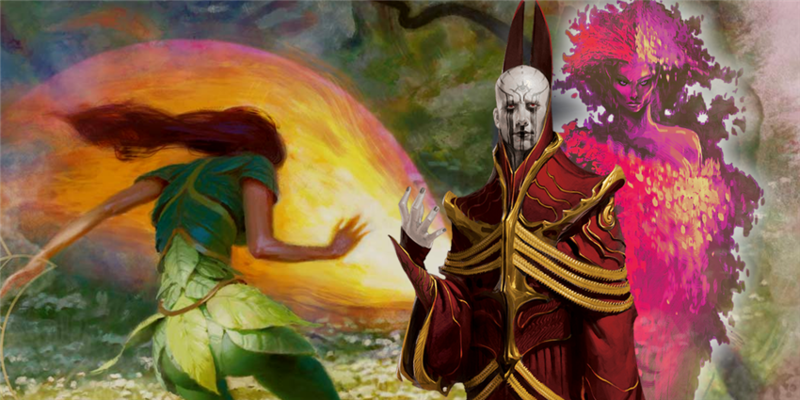 This week’s encounter is April Showers and Foul Flowers, a combat encounter that could also become a puzzle for the druids and rangers in your party. While the characters travel through a beautiful meadow, smelling the scents of flowers and earth after a rain, the flowers at their feet spring to life and attack, threatening to entangle and devour them! These foul flowers were animated by the foul magic of a dark sorceress who infused the rain itself with her evil. The characters could fight back against the sorceress and her army of animated plants, or they could try to undo her spell and save the flowers—and the nymph that guards them. This combat encounter is suitable for a party of 5th-level characters, but it can be scaled up to challenge a higher-level party. Druids and rangers may be able to resolve part of this encounter nonviolently. Characters proficient in the Nature skill may have an easier time avoiding the ambush at the beginning of this encounter. Additionally, part of this encounter can be solved non-violently by characters that can cast speak with plants, such as druids and bards. The characters may fall prey to a field of deadly flowers, brought to life by an enchantment woven by the cruel sorceress Pluviana. She wove this hex into the rain itself, and a mighty treant and the dryads which tended to her were poisoned and corrupted by her enchanted shower. Now, these defiled plants are completely under Pluviana’s control, and she plans to test out their destructive might on whatever innocent adventurers pass through the region. Pluviana was once a druid, but she was cast out of her clan because she struck down a pair of women who had formed a family within their druidic circle. Pluviana furiously fled in disgrace and her poisoned mind quickly began justifying her exile. Surely, she told herself, it was her circle that had turned to evil, not her. Surely, she attacked the women in her circle because they had fallen to debauchery and deviancy, and the rest of the circle had been tricked by their evil ways. Pluviana gave herself her current name because she grandiloquently believed that she was to be the purifying rain that wiped away all traces of her former circle’s supposed deviancy. True heroes can oppose her self-aggrandizing evil, but adventurers who want no part in her deranged scheme must fight just to survive. The characters are traveling across a wide open plain, perhaps from their last dungeon adventure and towards a local city. Along their journey, they find themselves in a meadow of bright green grass and vibrant violets. Druids, rangers, and other characters with a high passive Intelligence (Nature) check realize that something is wrong here. If these characters manage to pacify the enchanted plants here, they can avoid a savage combat—but failure leaves them vulnerable when a host of carnivorous flowers, enchanted by a foul sorceress, burst from the ground and attack. Partway through this fight, the sorceress appears either to gloat over the struggling warriors, or to bolster to her plants’ failing defenses. Defeating her won’t automatically fix the field of defiled flowers, but they will prevent her from causing any further suffering. If the characters don’t have an ally who can save the corrupted plants, then purifying this glade could be the basis of another adventure. The sky is filled with passing clouds, and the ground smells of wet earth after a rain shower. You walk along a dirt road passing through a field of vibrant green grass, and all around you are blooming flowers. Dozens of colors and a suite of unique aromas assail your senses, but the most populous of all these flowers are violets. A patchy sea of purple expands out on either side of the road that winds through this field. If a character has a passive Intelligence (Nature) or Wisdom (Survival) score of 15 or higher, they sense something unusual about the flowers. First, this particular species of violets are in full bloom wildly out of season—easily by a month or more. Second, the plants are gathered together in unnatural shapes. Some even look like humans laid out spread-eagled upon the ground. This character isn’t surprised when the plants attack. If a character has a passive Wisdom (Perception) score of 20 or higher, they notice that the plants seem to be moving and twitching—and there’s hardly any wind. This character isn’t surprised when the plants attack. While the most common type of passive score is passive Wisdom (Perception), any ability and skill proficiency can be used to make a passive check. In this situation, characters who either have an innate understanding of the natural world, or have extensively studied nature, can use their Survival or Nature skills to passively recognize that something about the plant life in this field is terribly, yet subtly amiss. Since passive Intelligence (Nature) and Wisdom (Survival) checks are uncommon, you may wish to ask for it by first asking if any characters are proficient in the Nature or Survival skills. If any are, ask what their bonus is. Once you know the bonus, add 10 to that bonus to determine the character’s passive score. Then, if any of the characters’ passive check succeeds, secretly tell them what they learn. This could be through whispers, by passing a note, or by briefly taking them out of the room and explaining the situation. Asking for a specific skill does lessen the surprise somewhat, but this could be a good thing for your group. By planting the idea that something involving knowledge of nature is in this area, you foreshadow the reveal of the carnivorous flowers. This turns the simple shock of being attacked by deadly plants into a dramatic beat, complete with set-up and pay-off. Some DMs may choose to do this through dramatic narration, but simply seeding this idea in their minds through game terminology can ramp up tension simply, more effectively, and without taking spotlight away from the players so that you can monologue. This method can make even narrative-oriented DMs’ scenes sharper and more dramatic. Their type is plant instead of fey. They do not have the Fey Charm action. They cannot speak any languages, but can speak fluently and intelligently if speak with plants is cast upon them. For both types of monster, their melee weapon attacks do an additional 3 (1d6) piercing damage as the violets bite into their target’s flesh. The dirt road is 10 feet wide, and a vast field of violets extends on either side. These violets are difficult terrain. Additionally, whenever a non-plant creature stars its turn in the violets or enters them for first time on its turn, a dozen tiny flowers snap at its ankles. These violets have a +5 bonus to hit and deal 3 (1d6) piercing damage on a successful hit. One violet-coveredshambling mound is on the side of the road. It attacks and tries to engulf the closest creature as quickly as possible. Four violet-covered dryads rise out of the filed approximately 30 feet from the dirt road. These dryads cast barkskin on their first turn of combat, then cast ice knife while they close the distance to the characters. Once they get close, half of the surviving dryads cast shocking grasp on the shambling mound to heal it, while the other half cast shillelagh and attack the characters. At Higher Levels: If the characters are at least 11th level, there are three shambling mounds and eight dryads. The damage of the violet field and the extra damage of the monsters is increased to 7 (2d6) piercing damage. 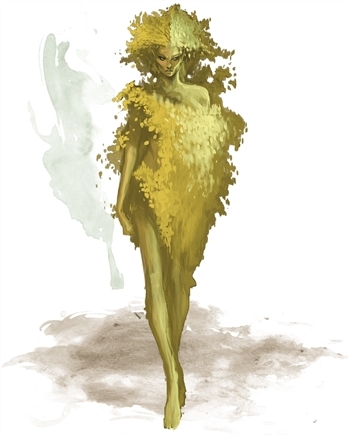 If any of the characters casts speak with plants and try to speak , they learn that these creatures are the twisted forms of creatures that were once dryads, and buried somewhere in this field is the dying form of a poisoned treant. All of these plants are acting against their will, and were bound to the will of an evil sorceress who calls herself Pluviana. A creature that can communicate with these plants can try to make a successful DC 15 Charisma check to try and convince the plants to leave them alone. On a success, the plants stop attacking for 1 hour, or until they are attacked again, or until the sorceress Pluviana commands them to attack. Additionally, this check can convince the field of violets to stop inhibiting movement and dealing damage when a creature moves through the field. Casting remove curse upon one of the plants (or a 10-foot square section of flowers) frees it from Pluviana’s curse, and it loyally fights on behalf of its saviors. Pluviana is a mage with a cape of the mountebank, a dread helm, and tree feather token. She is not harmed by the biting violets in the field of flowers, and they are not difficult terrain for her. She strides onto the battlefield to a point about 60 feet from where the adventures were first attacked while under the cover of greater invisibility, and then cackles to get the adventurers attention. Her voice carries easily across the field, and her rough location is easy enough to determine as long as she speaks, even though she is invisible. If asked, she melodramatically recounts the tale of her exile from her druid circle, and her ego permits her to monologue as long as she is able. If she is attacked or her invisibility ends, she uses her feather token to create a mighty oak tree beneath her. She uses this tree to stay out of reach of melee fighters, while she rains magical doom upon her foes. She doesn’t mind destroying some of her plants with fire magic as long as it kills the characters as well. At Higher Levels: If the characters are at least 11th level, Pluviana is an archmage with meteor swarm prepared instead of time stop. She also possesses a staff of swarming insects. If the characters defeat Pluviana, they can loot any magic items still in her possession. However, defeating Pluviana is not enough to undo the damage she has already done. Any of the dryads that are still affected by the sorceress’s curse continue to fight—or if the characters leave, they hunker back down in the field of carnivorous violets and wait to ambush the next unfortunate traveler that passes through this field. If the characters are able to speak to the dryads and manage to break the curse on at least one of them (see “Another Way to Win,” above), then the dryad will lead them to the body of a treant that lays catatonic in the field, buried in violets. Casting remove curse on the treant frees it from Pluviana’s enchantment, and it greets the characters and any purified dryads with grateful confusion. The treant, a mighty jacaranda named Viola, urges them to find a way to purify the entire field. This could be the beginning of another adventure, if the characters are interested in accepting this treant’s request. Viola promises them a charm of the nature goddess Ehlonna if they agree. As the DM, you are empowered to create this forthcoming quest, including its challenges and how the characters might cleanse the field. One possible way expunge Pluviana’s foul magic would be to hallow the heart of this field in the name of Ehlonna or another nature deity. The leader of the druid circle Pluviana was exiled from might have the power to cast this spell. Love the idea of this encounter. Going to try weaving the ideas into a future adventure for sure. "Once they get close, half of the surviving dryads cast shocking grasp on the shambling mound to heal it..." Ha, clever. I'm curious though; what level are these alternate dryads? Moreover, how many d8s do they get for shocking grasp? 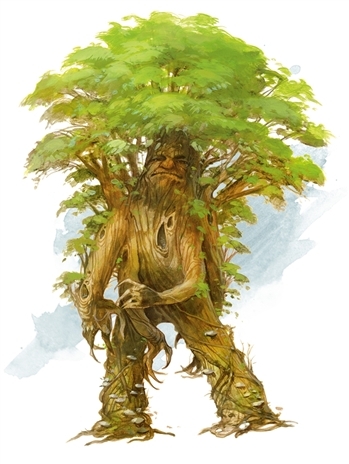 I assume that the shambling mound could choose to let the melee spell attack hit because it knows that the dryads are trying to heal it, but would it still lose its reaction? Because nature is an intelligence based skill that is typically only trained by characters that don't prioritize intelligence, the non-proficent wizard may be the most likely to pass the check. The alterations to these dryads' stat blocks don't alter their challenge rating, so they're still CR 1. Since their shocking grasp is cast through an Innate Spellcasting trait, their challenge rating counts as their level for determining the strength of their cantrips, and so shocking grasp deals 1d8 lightning damage. A basic ranger or druid would not be able to spot it. I would use a wisdom based nature check in this case. Everyone's comments about the nature of the passive Intelligence (Nature) check are well-founded. I've expanded that particular passive check to allow for a character's passive Intelligence (Nature) or Wisdom (Survival) score to reveal that something is amiss. Another nicely modular encounter that can be dropped into an existing campaign in many ways. I like the IRL influences upon these encounters makes running them that much more involved for the players. Thank you I love using these for my weekly games. 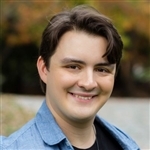 Keep Up the Great Work James! I love these little encounters. So creative and fun! Pluviana was once a druid, but she was cast out of her clan because she struck down a pair of women who had formed a family within their druidic circle. Pluviana furiously fled in disgrace and her poisoned mind quickly began justifying her exile. Surely, she told herself, it was her circle that had turned to evil, not her. Surely she attacked the women in her circle they had fallen to debauchery and deviancy, and the rest of the circle had been tricked by their evil ways. Pluviana gave herself her current name because she grandiloquently believed that she was to be the purifying rain that wiped away all traces of her former circle’s supposed deviancy. Is that a grammatical error? Yes; missing a "because." Thanks for bringing that to my attention. I absolutely love this one! It’ll definitely be in my next session as the PC’s are in a good spot for it. Keep up the good work! Love your encounters, tryed the dragon one against my group of level 2, it was a blast and a very fun sessions when that hapenned. my players totally loved it. It's great that there's running themes in some of these one shots. This could easily be used to reference the unicorn quest or even the gryphons and medusa quests. The villain’s backstory seems a bit strange, but that’s probably just because I haven’t read up much on the customs and taboos of Druid circles in Forgotten Realms/D&D Common. i really do like the mechanics of the encounter, especially the way the Druid’s innate spells were switched out for spells of the same level. I know it’s simple, mentioned in the Basic Rules and done all the time in modules, but I never really thought to do it with innate casting. I rearly like the flavor of using Wizard instead of Druid spells (like Shocking Grasp) for the “corrupted” Dryads. It’s unexpected, and helps to set up the Former Druid villain. These Encounters have been awesome, I only have one thing I'm stuck up on for this week's run. I have been DMing for a few months now, but were getting to the point where I'm really unsure of the power dynamic between the PCs and the enemies. My party is currently level 11, and tonight we'll have 4 people with us. In short, I want to use the scaled up version of this encounter, but I am pretty sure that Meteor Swarm will completely wipe everyone. I don't want to just not cast Pluviana's most potent spell, but at the same time I'm unsure what would be a good alternative. Any Ideas? Depending on the party makeup, that sounds like a reasonable fear. (Though I generally find PCs are a little tougher than they first appear). Perhaps you could replace Meteor Swarm with something like True Polymorph, Which gives you some wiggle room with how mean you want to be. Feeling that the table is in the right mood for a struggle, you could take a player off the board by turning them into a mundane shrub. If you want to be a bit nicer, you can turn them into a plant-creature (perhaps one of the Dryads) to shake them up, and take the edge off.